We offer a range of glass tints and choices for your Sculptural Glass Door. Tinted glass is more widely used in commercial settings than in residential doors but we feel these subtle shades have a lot to offer adventurous homeowners and designers. The tinted glasses are more naturally reflective, so the sculptural relief is more visually prominent. We think you get a little more bang for the buck in terms of visual impact. Tinted glass is more reflective and thereby provides a greater measure of daytime privacy – one can’t see through reflections bouncing off of the curved forms. In terms of performance, all of the tints block a high percentage of harmful ultraviolet rays and have the benefit of enhanced thermal performance. If you plan on painting your doors, a tinted glass may add an interesting dimension to your palette. For more information and notes on the tints we offer, please go to Choosing Your Glass Color. Privacy Option: To extend the range of places where you might consider using a Sculptural Glass Door, we offer Lacey (Clear Glue Chip) and Pebble Beach as glass types that can be formed to our designs. As a custom upgrade, we can make a dual tempered insulating unit using Clear Pebble glass or a Satin Etch fritted glass as the interior backer piece in the unit. Privacy options are discussed more fully in the FAQ section. Samples: For contrast, the photos below present the glass close against a flowering plant background. This shows the tints a little darker than your real life conditions which will often have sky and space and light coming through. If you want to purchase one of our doors but are undecided on which color to choose, you can call to request small samples of 2 or 3 of the glass tints below. There is a nominal charge for this service, but it is fully refundable with your door order. 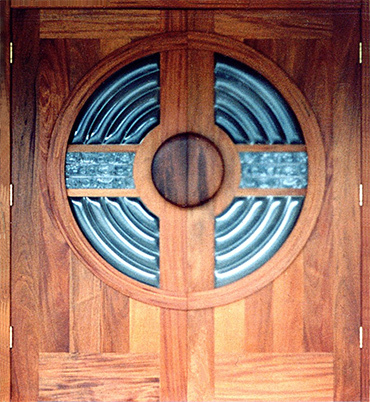 We offer our doors in your choice of 2 wood species: African Mahogany (Sapele), and CVG Fir (clear, vertical grain Fir). Stain options further expand your range of possibilities for color and tone. Sapele Mahogany is a durable hardwood with an attractive grain, excellent for exterior use. It has a brown color with reddish undertones which gives a lively sheen when clear finished. Sapele Mahogany is a genuine mahogany which darkens over time. Our Pacific Northwest Douglas Fir grows tall and straight with tight growth rings that yield vertical grain lines running the length of the door stile. CVG Fir has warm color tones in the yellow to orange/red range that deepen over time, lending a subtle richness. Our made to order doors are built to the highest architectural standards. Sculptural Glass Doors are crafted with Mortise and Tenon construction, a centuries-old joinery method for locking wood joints together. This technique involves cutting a mortise, or hole, in the stile; and forming a tenon, or projecting tongue, on the rail, and fitting them tightly together to form a secure bond between vertical and horizontal structural components. Waterproof bonding agents are applied inside the joint. An overnight clamp and cure process permanently joins together the stiles and rails. We build our doors from engineered stiles and rails. Our premium grade veneers are heat and pressure bonded on super strong laminated cores. Finger-jointed stave pieces are edge glued and laminated into a solid core. The offsetting grain patterns produce a core that is much stronger and more stable than a solid wood piece would be by itself. Our veneers are cut from hand selected premium woods and are generally thicker than you might find elsewhere. We cut our own veneers in the shop to a standard thickness of 1/8″. This dimension is prior to final sanding of your door. In every detail, quality comes first. 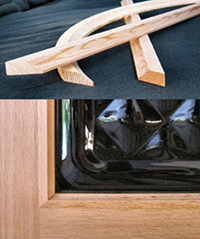 Custom moldings are milled in the shop to give your door a truly distinctive look. All joints are permanently bonded using the best Type 1 exterior adhesives. The glass is set into the door using a silicone bedding. Our insulating glass units are built using a dual seal warm edge thermal barrier technology. We build with integrity, and are proud of our work. Our standard size doors are 1.75″ thick, 36″ wide, and come in standard heights of 80″ and 84″. We do offer an oversize width option of up to 42″ on most designs. We also offer an 8 foot door for most of our rectangular glass designs. We build our 8 foot doors with a panel in the lower section as shown in the unfinished pair on the right. Oversize widths and 8 foot doors are offered in either Sapele Mahogany or paint grade (PG) Fir. For non-standard widths and 8 foot doors, please specify a design along with all desired options and request a quote over the phone (360.389.3129) or through the contact form (see menu bar above). For standard 32″ wide doors, we offer 2 designs: Aura-32 and Cobbles-32. Although not pictured here, Cobbles-32 is the same as Cobbles, but 5 squares across instead of 6. Pricing is the same as the similar 36″ doors. We offer the following Factory Finish options: Clear Finish; Stain with Clear finish; or Primed for Paint (latex primer). For a natural wood look, we use hand applied Sikkens stain and finish products for exterior doors. These provide a great long lasting finish that can be easily maintained. For interior doors, we use a sealer plus a premium 2 part catalyzed exterior polyurethane, sprayed, satin finish, 3 coats minimum. This gives a very hard furniture-like finish. You may, of course, order your door unfinished. We recommend a light sanding with a 320 grit sandpaper or 0000 steel wool prior to sealing. Apply the best quality paint, stain. or clear finish in accord with the manufacturers recommendations and specifications. See our Prior to Installation and Care and Maintenance sections. You may order your door(s) shipped as a ready-to-hang package. Besides having the wood jamb match the door, many prefer a pre-hung door for fit and ease of installation. Door prep and fit is easier and more accurately done on our CNC machines rather than in the field. Each unit is pre-assembled by our precision hanging team to guarantee a perfectly functioning door. Jambs are then disassembled for shipping. With a pre-hung entry, the door is fully prepped, both long edges are beveled, and the door is routed for hinges. Milling and routing for standard cylinder Lock Prep is included. Mortise Lock Prep is available for an additional charge. Our pre-hang package is custom sized to your specifications and comes fully weather-stripped, with metal threshold and hinges in your choice of finish. 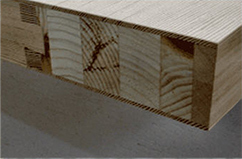 Jamb Width: we offer two standard jamb widths: 4 -9/16″ and 6 -9/16″. Custom jamb widths may be specified at added charge. Please call or request a quote through the Contact form (see menu bar above). If you are not ordering the pre-hang package, you may still have your door lock prepped. Multi-point lock systems are also available and recommended for 8 foot doors. Have your own wood shop? Know a local craftsman you trust to build a quality entry door? Have a unique application for our cast glass architectural design elements? 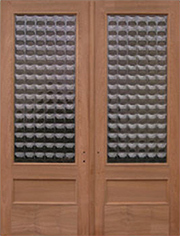 Now you can buy just the sculptural glass doorlite and build or commission your own stunning high end doors. We now offer fully tempered and insulated Sculptural Glass Doorlites from our door collection, any rectangular design, in light bronze or gray glass, for $995 plus crating and shipping. Other colors and options available. Note that you are limited to working with existing glass sizes from our collection. We do not offer custom sizing of the glass. It is highly unlikely that our glass will fit a pre-existing door without modifying that door. Plan to have a simple stile and rail door built from scratch, with your own choice of wood. Glass specs for rectangular units: Most of our doorlite designs measure 25.75″ x 61.25″; Opening in the door to receive those designs: 26″ x 61.5″. Thickness of the insulating unit at edge is 5/8″. Three of our designs (Flow, Grace, Accord) are 25.75″ x 56.875″; we also have two contemporary designs that we offer to fit a 32″ wide door (Aura-32 and a version of Cobbles). These glass units are 21.75″ x 61.25″ to fit an opening of 22″ x 61.5″. Cast glass made with 1″ flat perimeter lip as shown below. 1″ wide molding or rabbet needed for proper sight line. Glass units should be wet glazed, silicone recommended. The sculptural art glass is generally set facing the exterior of the room, flat side to the interior. Please call or email through our contact page for more information.